The last day of the year seems like a good time to say thank you. 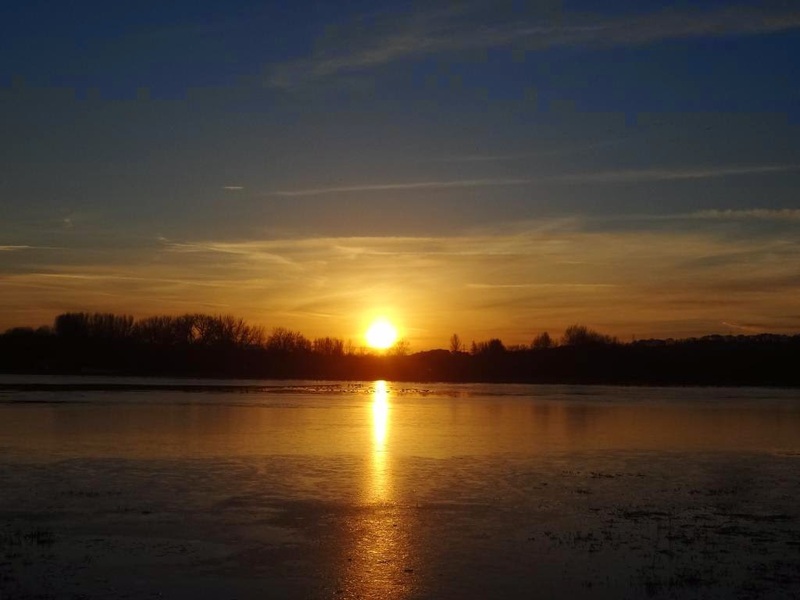 Over the course of 2014 the number of visitors to this blog has risen rapidly, mostly because of people coming via Twitter, and I've made the acquaintance of many wonderful new readers. I want to end the year by thanking you all for reading, commenting, sharing and contributing here, and I want to explain a little why that means so much to me. I hope you can tell from this blog that I love my work. I love research, and I love medieval literature, and I love teaching it and thinking about it and I'm never happier than when I'm absorbed in it. Nonetheless, academia is not always a happy place to work. I'm a very junior academic, and to people in my position a career in academia offers a daunting future: a life of short-term contracts and little security, with very limited ability to plan ahead. You can probably imagine the psychological effects of this, and the impact it can have on one's confidence and sense of self-worth; if not, this article explains very well what it's like to be in this situation. Most of my friends are also early career academics, in a similar position, and when I look at them I see talented young people consumed with anxiety and fear about the future, constantly doubting their value as scholars, and consequently as human beings. The system feeds, almost encourages, such anxiety. I remember that just after I started my current job we were learning about the training sessions on offer for junior academics, and were told that their most well-attended session ever had been about 'coping with a fear of failure'. Everyone kind of laughed and looked unsurprised, but this fact stuck with me, and it's sad, when you think about it. By no rational definition could any of the people attending such a session be considered failures: these are graduate students and young academics studying and working at Oxford, which proudly calls itself one of the best universities in the world. You can't get where they are without being talented and dedicated, incredibly hard-working and motivated, excelling again and again at exams and job applications and all the things one is supposed to succeed at in order to find a place in the world. It's hard not to feel that they've done everything right, but nonetheless they - we - can't feel secure. I'm in that position myself, and I too feel like a failure. I don't think I am, yet (am I? don't tell me, if you think I am) but I feel like one, every day. The precarious nature of academic jobs is an endemic problem, perhaps not something individuals can do much about, but academics often don't help this pervading mood of anxiety by just not being very nice to each other. As an academic you are confronted all the time by scepticism, criticism, doubt, and to an extent, that's fine - that's how academia operates, its bread and butter, and constructive criticism can be a real gift. But a lot of the time you're dealing with criticism which feels unnecessarily vindictive, actually designed to torpedo your sense of self-worth. Criticism is all you ever hear, because it's no one's job to encourage you or tell you what's good about your work - only how it can be improved. Senior academics in positions of power who use that power to be generous and supportive towards younger scholars are absolutely worth their weight in gold, and I've been fortunate enough to be helped by several, but they often seem to be in the minority. Part of the fear of failure is feeling almost desperately dependent on the goodwill of more powerful people, without any control over the fate of your own work; reviewers and academic publishers, for instance, have a huge amount of power over my future, and I have no influence on them whatsoever. I have to get my work published if I ever want to get another job, so they're free to treat me however they want and I have to do as they ask, lest they decide to say 'actually, we won't publish this after all'. That's a frightening situation to be in. This is where blogging helps. It might seem like nothing to you, but with blogging I'm in control of what I write and post; it might be badly written or contain errors or someone just might not like it, but at least I don't have to get anyone's approval to write it, or apply for permission, or dread the prospect of an anonymous critical attack. That sense of freedom has been very good for my scholarship, in ways I might discuss in another post, but it's also been good for me personally. In response to my blog I receive a constant stream of positive feedback, and I can't tell you what a boost that is to me amid my daily anxieties. Perhaps that makes it sound like the benefits of blogging are chiefly selfish, but what I love is not people saying nice things about me, but recognising the value of the texts I write about. 'That poem is amazing!' is my favourite type of comment; it means, I hope, that I helped someone see how and why a text they wouldn't otherwise have encountered can indeed be amazing. The tone is just so different: there's enthusiasm and interest and passion of a kind you rarely hear expressed within academia. People who aren't used to blogs worry about getting negative feedback through blogging, and of course you do get the occasional troll, especially on Twitter - but in six years of blogging I've never received a comment anywhere near as maliciously crushing as anonymous academic peer review can be. The overwhelming majority of my readers are friendly and eager to learn and ready to contribute knowledge of their own; if they have criticisms, they express them politely. It turns out that out there, outside academia, a lot of people are just really nice. And living and working as I do, inside my own head, it's a lovely surprise to find that out. 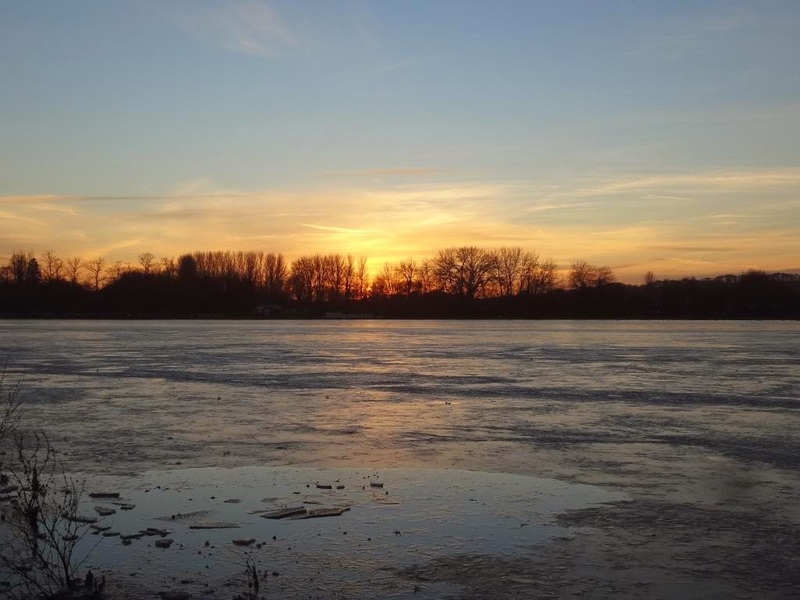 There's still debate within academia about blogging, and a considerable proportion of academics who don't understand why anyone would bother to do it. When people ask me about my blog (I never bring it up myself, because I worry what people I know in real life will think of it) they often do so with an air of puzzlement: why would you want to do that? Why would you write if you're not getting anything out of it? And it's true I'm not really getting anything tangible out of blogging, and career-wise it may do me more harm than good; I sometimes imagine sceptical 'real academics' stumbling across my blog, silently judging me, and going away again, and you never know how that might come back to hurt me. To many of the people who have power over my career, blogging doesn't count as a worthwhile activity, even as a form of outreach or impact. But the intangible benefits are immense, and it's been more rewarding than almost anything I've ever done. To be able to write about texts I care about, which I feel are interesting and important and should be better known, and then find a willing and appreciative audience who want to hear about them, is a daily joy. That's because of you, my generous and open-minded readers. I write about texts I like and want to share, and most of the things I choose to post about I could never publish in another forum, so it's particularly encouraging that many of my most popular posts this year have been about some of the most obscure texts: the Old English Menologium, Anglo-Saxon sermons, very minor Middle English lyrics, a little-studied Norse saga. These posts have each attracted hundreds of readers within a few days of posting, and have been received with an enthusiasm which amazes me. Perhaps the element of novelty is a draw - these texts are not the kind of thing anyone would encounter unless they had been studying medieval literature for a few years, and so they are unfamiliar and surprising, maybe. 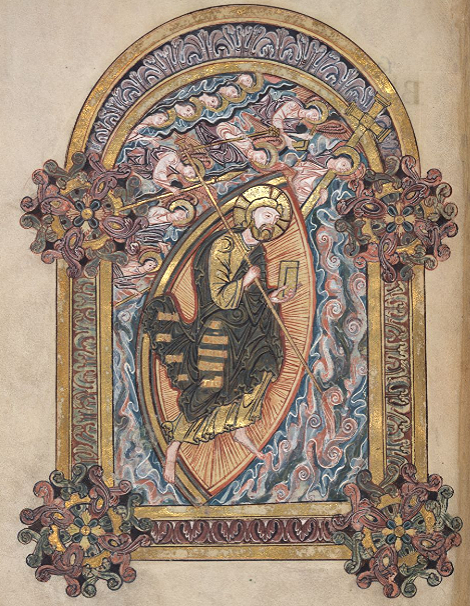 I think that many people who've never studied medieval literature (especially Old English), and even some who have, don't know just how much they don't know; they think the corpus is small and predictable, and so react with astonishment and delight to something unexpected, like Christ III. But still, if you had to pick anything - anything! - you thought a non-specialist audience would be interested in, Ælfric's sermons would be way down the list, let alone the Menologium or the Christ poems of the Exeter Book. Sometimes people comment on my posts (meaning to be kind) 'you should write a book about this!' which, although a well-intentioned comment, is a little painful to hear, because at the moment no one would publish a book by someone as junior as me about texts as obscure as the ones I write about. Who would want to read that? Well, my blog readers, thank goodness. So, if you've read this far, thank you. 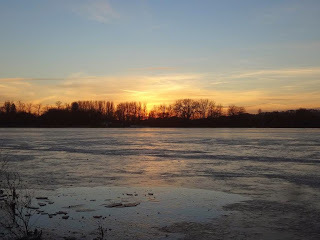 Thank you for reading, commenting on, sharing my posts. Thank you for being enthusiastic and generous in your responses, for sharing my enthusiasm. If you're a non-specialist, as the majority of you are, thank you for being open-minded, willing to engage with texts which even within academia are seen as hopelessly esoteric, too obscure for undergraduates and the kind of thing no non-specialist would ever care about. And if you are a specialist, a 'real academic', thank you for being generous enough to read the blog of someone much junior to you, who values your approval more than you can imagine. And all of you, thank you for being kind. This is an exquisitely sad nativity song, a lullaby addressed to the baby Christ, but full of compassion and pain and regret for the suffering that the child will later undergo. It dates to the fourteenth century and comes from a manuscript compiled by a Franciscan friar, John of Grimestone. Pyne and wo to suffren heer for thyng that nas thyn owe. Thou are sent into this world, as thou were forsake. For swiche peynes as thou shalt dreyen were nevere non so smerte. For-than thy body is bleik and blak, soon after shal ben drye. No thyng free upon thy body of pyne shal ben lete. The harde bond of love-longyng that thee hath bounden so. Lullay, lullay, litel child, litel child, thyn ore! It is al for oure owene gilt that thou art peyned sore. And leten synne for thy love, ne keptest thou no more. In sorwe endeth every love but thyn atte laste. John of Grimestone seems to have had a fondness for lullaby poems of this kind, since his manuscript also includes this lullaby and this on roughly the same subject. 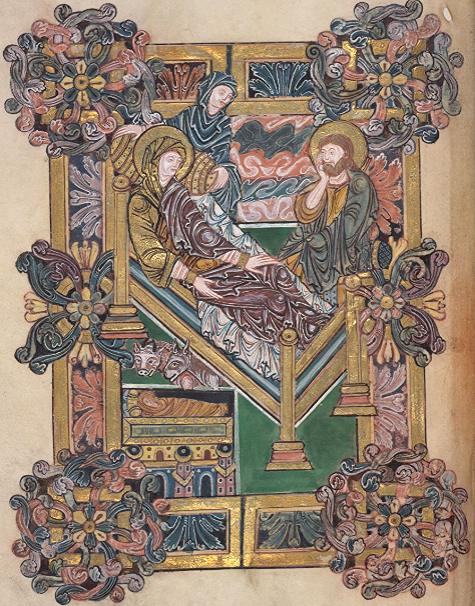 'Lullay, lullay, little child, child, rest thee a throwe' is also close in style and theme to this poem in the same metre, sometimes known as the 'Adult Lullaby', which is not addressed to Christ but to an ordinary baby. In both cases the central image is of the crying child, innocent and uncomprehending, who weeps for no reason - and yet has a reason to weep, though he doesn't know it, because of the world he has been born into. Pain and woe to suffer here for a crime that was not thine own. Thou art sent into this world, as if thou were forsaken. Lullay, lullay, little boy, king of all things! For such pains as thou shalt suffer were never none so sharp. Thy body then will grow pale and white, and then it shall grow dry. Thou art come among those who shall cause thee to die. The hard bond of love-longing that has bound thee so. It is all for our guilt that thou art pained so sore. In sorrow endeth every love but thine, at the last. Lullay, lullay, thou little tiny child. The whole life of Christ was a continual passion; others die martyrs, but Christ was born a martyr. He found a Golgotha, where he was crucified, even in Bethlehem, where he was born; for, to his tenderness then, the straws were almost as sharp as the thorns after; and the manger as uneasy at first, as his cross at last. His birth and his death were but one continual act, and his Christmas Day and his Good Friday are but the evening and morning of one and the same day. John of Grimestone's poem perfectly illustrates that idea. Đa gelamp hit, þaða hi on þære byrig Bethleem wicodon, þæt hire tima wæs gefylled þæt heo cennan sceolde, and acende ða hyre frumcennedan sunu, and mid cild-claðum bewand, and alede þæt cild on heora assena binne, forþan þe ðær næs nan rymet on þam gesthuse. Do you even need a translation of this? Then it happened, while they were lodging in the town of Bethlehem, that her time came to give birth; and she gave birth to her first-born son and wrapped him in baby-clothes and laid the child in the asses’ manger, because there was no room in the inn. 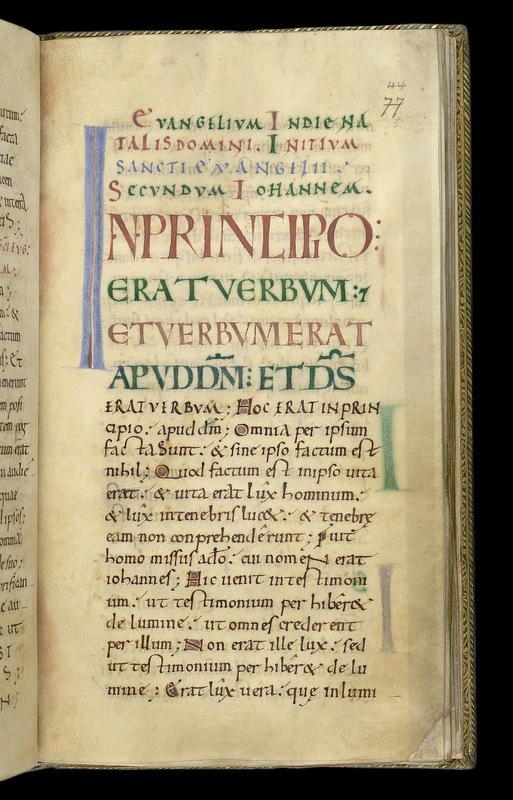 He goes on to translate the rest of the Gospel story before interpreting it, but for that you might prefer to read (and listen to) the translations in the West Saxon Gospels, here. Note that Christ is born in a gesthus and laid in a binn - you don't need me to tell you what those words mean! 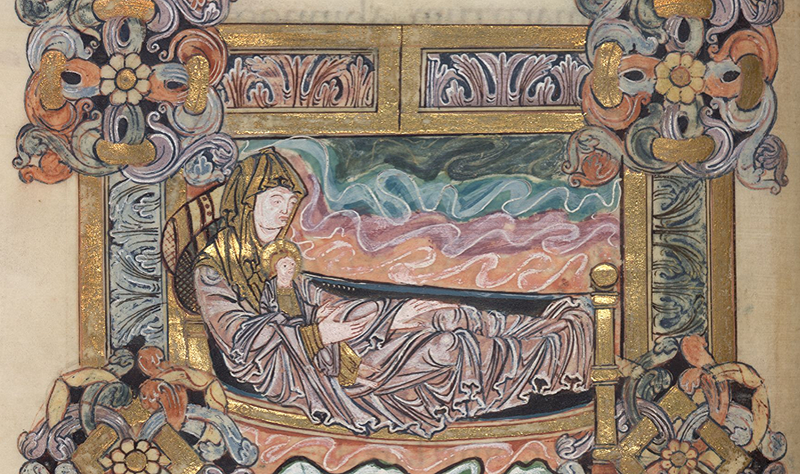 Þa hyrdas ða spræcon him betweonan, æfter ðæra engla fram-færelde, "Uton gefaran to Bethleem, and geseon þæt word þe geworden is, and God us geswutelode." Eala hu rihtlice hi andetton þone halgan geleafan mid þisum wordum! "On frymðe wæs word, and þæt word wæs mid Gode, and þæt word wæs God". Word bið wisdomes geswutelung, and þæt Word, þæt is se Wisdom, is acenned of ðam Ælmihtigum Fæder, butan anginne; forðan ðe he wæs æfre God of Gode, Wisdom of ðam wisan Fæder. Nis he na geworht, forðan ðe he is God, and na gesceaft; ac se Ælmihtiga Fæder gesceop þurh ðone Wisdom ealle gesceafta, and hi ealle ðurh þone Halgan Gast geliffæste. The shepherds then spoke amongst themselves, after the departure of the angels: "Let us go to Bethlehem, and see þæt word þe geworden is, which God has made known to us." O, how rightly they confessed the holy faith with these words! "In the beginning was the Word, and the Word was with God, and the Word was God." A word is the revealing of wisdom, and the Word, which is the Wisdom, is brought forth from the Almighty Father, without beginning; for he was ever God of God, Wisdom of the Wise Father. He is not created, because he is God, and no created thing; the Almighty God created all created things through that Wisdom, and gave them life through the Holy Ghost. This last paragraph is just glorious, as Ælfric ties himself up in a joyous knot of language over the phrase þæt word þe geworden is. In Old English word can mean 'message, tidings', and geworden can just mean 'happened', so what the shepherds say to each other is 'let us go to Bethlehem, and see these tidings which have happened'. But because word also means 'word', and geweorþan also means 'to come to be', the shepherds' speech - 'with these words' (mid þisum wordum) - can be interpreted in another way. þe word is geworden: the Word has come to be. There's something similar in the Vulgate, where the shepherds say videamus hoc verbum quod factum est (and the linking of this to the opening of John's Gospel was traditional), but the English is even more intimately linked because word is embedded within geworden. And since words can be mined for meaning in this beautifully complex way, 'a word is the revealing of wisdom' (there's a motto for all students of literature to take to heart! ); and this Word is the revealing of Wisdom, God from God, Wisdom from the Wise Father. The Word is not geworht, he is geworden - not 'created', but 'come to be'. This is difficult to convey in translation, but it's a beautiful felicity of language and you can almost feel Ælfric delighting in it, grammarian and translator and lover of language as he was. The things words can do! 'A word is the revealing of wisdom'; and "On frymðe wæs word, and þæt word wæs mid Gode, and þæt word wæs God". If you're in the UK, you may have been watching the recent BBC series of programmes about Canterbury Cathedral. If you haven't been, I recommend it - the series is on iplayer here. I grew up near Canterbury and know the cathedral well - and I study its medieval history, as you will have gathered if you've been reading this blog any length of time - but this series has nonetheless been full of surprises, showing a friendly side of the place which is usually kept hidden from the public behind high and forbidding walls. Away from the cathedral, the highlight for me was seeing the boys' choir visit a shrine to St Thomas Becket in Norway, continuing testament to the great popularity of St Thomas in Scandinavia - in the Middle Ages the English and Scandinavian churches had very close links, and after his murder Becket rapidly became a popular saint in the north. There's an Old Norse translation of Thomas's life, and sagas contain various references to Norwegian and Icelandic pilgrims to St Thomas' tomb: my favourite example to cite is Hrafn Sveinbjarnarson, who visited Canterbury in the late twelfth century and presented the tusk of a walrus at St Thomas' shrine to thank the saint for a good catch. It was nice to see these links still valued by the present-day church. The series is a look at the life of the cathedral, not a historical documentary, and some of its way of talking about the cathedral's history set this medievalist's teeth on edge; that's only to be expected in a programme of this kind. (At one point the narrator says the monks 'disappeared' in the sixteenth century, which is a pretty facile euphemism for what actually happened to the thousand-year-old community when Henry VIII came along.) But it's thought-provoking for a medievalist, too. I'm currently working on history-writing at Canterbury in the late eleventh/early twelfth centuries, looking at texts which provide fascinating snapshots of the cathedral community in that period. This series' focus on community has therefore been helpful for me in thinking about the context within which the texts I'm interested in were produced; as an academic it's often easy to forget that medieval writers, especially monks, were not (like me) hidden away in a library, consorting mostly with other scholars, but were working in the middle of busy communities among people who didn't necessarily care that much about history or the things which preoccupy historians. A medieval monk-historian did not get to spend his hours at will on books and writing, but had to share in the life around him, all its concerns and business, big and small. A monastic community is different from a cathedral one, of course, but there's still all the stuff of daily life to deal with: maintaining the building, managing visitors, trying to raise funds, balancing conflicting priorities. 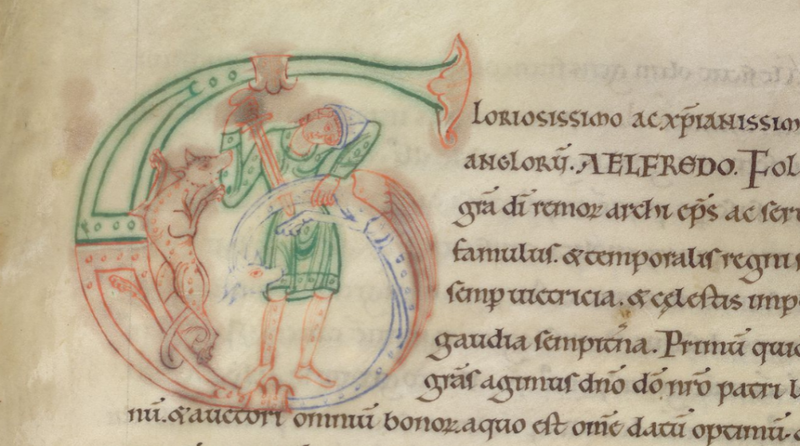 My favourite Canterbury historians are Osbern and Eadmer, two English monks who entered the cathedral community as children, in the decade or so before the Norman Conquest. (Osbern was born probably c.1050, Eadmer c.1060.) They both grew up in the monastic community at Canterbury, and spent most of their lives there. In that period they saw a huge amount of change at the cathedral, especially in the immediate aftermath of the Conquest: the English archbishop was deposed, new Norman monks imported into the community, and even its physical fabric collapsed around them when a fire in 1067 destroyed the Anglo-Saxon church (most of what we know about that building comes from Eadmer's memories). By the time Osbern and Eadmer reached adulthood, all the certainties with which they had grown up had been called into question. They wrote, in part, to defend the good things about Canterbury's Anglo-Saxon history against ignorant or sceptical incomers. They had no doubt that Canterbury was the oldest and the most important of the English churches, which had been the home of saints and scholars for centuries. Osbern interprets Canterbury's pre-Saxon name Dorobernia (that is, Durovernum) as if it were an Old English compound meaning 'door of the barn', because it is, he says, the very door to the kingdom of England. (This etymology is hilariously wrong, because it's not an Old English word, but you can't really blame him for not knowing that - and it neatly encapsulates how important he believed Canterbury was.) By the late eleventh century Canterbury already had a roll-call of great men to be honoured, chief among them the incomparable tenth-century archbishop, scholar and administrator St Dunstan, and St Alphege, the saintly archbishop who had been martyred by Vikings in 1012. 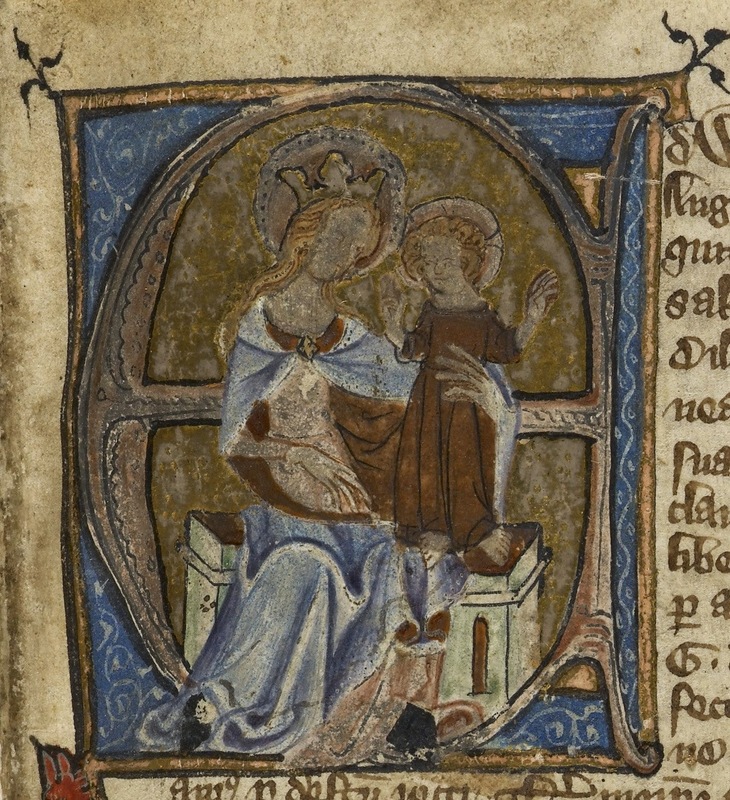 Osbern, who grew up to be a talented musician and precentor of the cathedral, wrote only about these two saints, but Eadmer was much more prolific: he wrote lives of several more of Canterbury's Anglo-Saxon saints, and much else. After Anselm was made Archbishop of Canterbury in 1093 Eadmer became his companion and friend and eventually wrote a wonderful biography of Anselm - as well as a 'history of recent times in England' which is of inestimable value. With Anselm, Eadmer travelled through Europe and saw many great churches and many great people, but Canterbury always had the first place in his heart. Contrary to the impression given by the BBC series, Canterbury was a destination for pilgrims long before St Thomas Becket's death in 1170, and the stories Osbern and Eadmer tell about visiting pilgrims vividly conjure up the busy life of the eleventh-century cathedral. There are touching stories of old blind women and sick children coming to be healed at St Dunstan's shrine, typical of the genre but endearingly precise in their everyday details: the little blind girl whose mother found out she could see when she ran off to chase an apple rolling away into the church, or the monk who had been paralysed for thirty years and, when cured and able to stand up, turned out to be unusually tall. The monks, of course, interacted with these pilgrims, and Osbern describes two miracles he witnessed in the cathedral when he was a child which clearly made a lasting impression on him. One day, he says, he was singing with the boys in the choir when he witnessed a young girl being healed of blindness by Dunstan's intercession, blood pouring from her eyes as the boys looked on in amazement; on another occasion he was in the church tending an altar and was asked by a sick woman to direct her to Dunstan's tomb, where she was healed - Osbern's first foray into guiding people towards St Dunstan, which was to be his life's work. 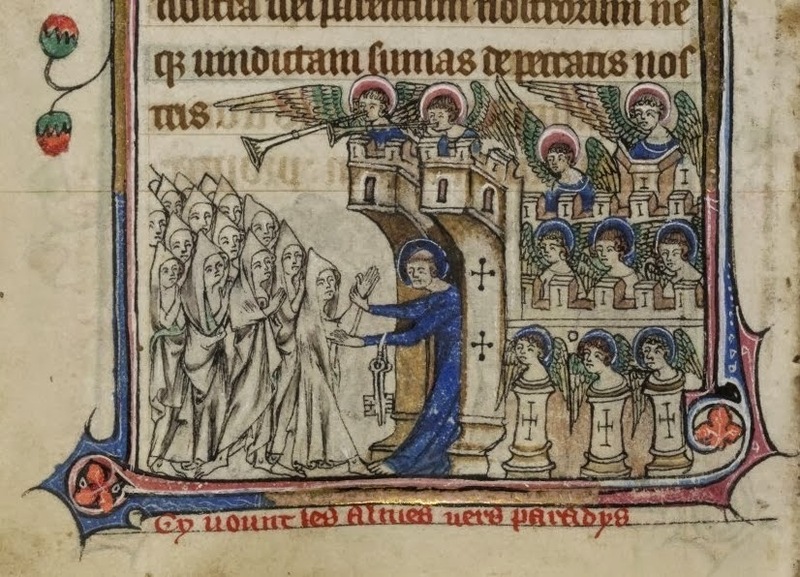 And it's not just the pilgrims who are brought to life in these texts: we see glimpses of the fractured state of the cathedral community under Lanfranc, Anselm longing to stay at home at Canterbury with his monks like an owl among her chicks, monks having visions inspired by the cathedral's own saints. It intrigues me that the pre-Thomas Becket history of the cathedral should be thus largely ignored. Priorities change, and our view of the past is always shaped by the needs of the present; that's the whole story of Canterbury in the eleventh and twelfth centuries, too, which is one reason I take note of these things. I take an interest (as you may have noticed on this blog) in how English churches remember their Anglo-Saxon history, and while there's always a bit of me that's not surprised when they overlook it, it's remarkable to see how sensitively and creatively some places are prepared to respond to this part of their past. When I visited Worcester in September, for instance, they had a thoughtful exhibition about the cathedral's early history, including descriptions and images of manuscripts produced at the monastery and quotations from Old English texts, and reflections on Anglo-Saxon spirituality (the spirit of John of Worcester lives on there, perhaps). In the summer I visited Ely and Bury St Edmunds for the first time and was impressed by the quiet certainty in both cathedrals that visitors would be ready to learn about St Etheldreda and St Edmund, and their provision of outward signs of devotion (candles, prayer cards) to encourage serious reflection on the saints' lives and significance. But at Canterbury, that doesn't fit with the story the cathedral wants to promote about its medieval history. Thomas Becket is easy to sell, and a mildly cynical précis of Chaucer's worldly pilgrims entertains the tourists. (Don't get me started on the irony of perpetuating any kind of 'worldly pilgrims/greedy medieval monks fleecing their visitors' story in a church which charges a hefty entrance fee.) There's something sadly appropriate in Canterbury's readiness to forget its Anglo-Saxon past, since the very reason Osbern and Eadmer wrote about Dunstan and Alphege was, they thought, to save them from oblivion. I don't mean to sound too critical; I want to love Canterbury as much as Eadmer and Osbern did, but the people sometimes make it difficult. This documentary series has been a nice insight into an otherwise invisible world: behind the scenes, away from the snappish guides who are the public face of the cathedral, there are many dedicated and apparently lovely staff and volunteers keeping the place alive. There always have been, even when those dedicated and lovely people were chiefly monks. (Some of the monks probably weren't that friendly to visitors, either.) It's important to be reminded that communities always have difficult people in them, and that good work is often produced amid trying circumstances. This was true in the eleventh century, and it's true today. The context of these lines is rather difficult to explain, because this is, quite apart from anything else, a beautifully intricate manipulation of narrative time: this description of the incarnation comes after the destruction of the world, when Christ appears in glory with the radiant Cross at his side. At the sight of the wounds he bears, sinful mankind is forced to confront the evidence of their cruelty towards him, which the poem describes; then it says they should have known who he was, because 'from the origin of the world' it had been prophesied that the earcnanstan would come. In the middle of a poem which is about the future, the end of the world and the second coming, this loops back to a moment when the first coming itself was still in the future, the subject of prophecies and hope but not yet of reality. Such a link between Advent and Apocalypse is an ancient part of the church's observance of the season before Christmas (an idea explored in an Anglo-Saxon context by Ælfric in an Advent sermon I posted recently), and this description of the incarnation, embedded within an account of the end of the world, follows that conventional association of ideas. But why is Christ called the earcnanstan? One reason might be that this poem, like the Biblical descriptions of the Apocalypse, is studded with literal and metaphorical precious gems: Revelations describes God as appearing like jasper and ruby, enthroned upon a rainbow like an emerald, and in Christ III the stars are called tungolgimmas 'starry gems', the eyes heafodgimmas 'the head's gems'. Among all these jewels, Christ is the most precious: the gem, the earcnanstan. In the passage quoted above there's a notable emphasis on the language of nobility, drawn from secular lordship; God is called wuldres agend, literally 'the owner of glory', and both Christ and Mary are called æþele 'noble'. The word used for Mary, cwenn, can just mean 'woman', but frequently also 'queen' (it's the origin of the Modern English word, of course). The earcnanstan seems to fit with this royal context. Not only are precious stones naturally associated with kings and queens, but the first element, earcnan, seems to mean something like 'noble'; it's found in some early Anglo-Saxon royal names, such as Eorcenberht, seventh-century king of Kent, and St Erkenwald. Perhaps 'noble stone' would be a better translation - fitting for The Hobbit's royal heirloom. (sceaða means 'robber, criminal' so I don't think burglar is too inapposite a translation...) Bilbo's nighttime deed of daring with the Arkenstone brings about a day of judgement of sorts - and certainly sudden destruction. J. R. R. Tolkien, The Legend of Sigurd and Gudrun, ed. Christopher Tolkien (London: Harper Collins, 2009), pp. 179-180. Tolkien, The Legend of Sigurd and Gudrun, ed. C. Tolkien, p. 305. 'The words linger'. No one did more than Tolkien himself to make this come to pass; every time you hear the word 'Arkenstone', even amid the sound and fury of the Hobbit movies, you're hearing a word of Guðrún's lament. You can make up your own mind on how much all this tells us about the Arkenstone of The Hobbit, but it's a reminder, I hope, of how complex a history any single word 'borrowed' from Old English or Old Norse really has – what a deep well of legend and poetry Tolkien was drawing from as he created his mythology. There is a tendency in some quarters (usually among people who know a lot about Tolkien but not much about medieval literature) to talk as if Tolkien just went around cherry-picking words from other texts and languages, uprooting words from their original context(s) and planting them anew in Middle Earth, carrying nothing with them. Many authors do this kind of thing without much thought, but not Tolkien; words and names bear meaning and history, and who knew this better than Tolkien the philologist? A word which can be used as a name for Christ and for the pre-eminent dragon-slayer of Germanic legend, for the kingdom of heaven and for one of the most perilous objects of Norse mythology, for the Virgin Mary and for the necklace of the goddess Freyja, is a word located at the centre of an intricate web of literary traditions. Perhaps you think that to investigate these contexts is excessively pedantic, but it follows a good example: Gandalf's very first words in The Hobbit are a philological quibble, insisting to know what, out of a four possible meanings, Bilbo means by his polite 'good morning'. If we imitate him and ask what 'arkenstone' means, we have to take all these many medieval contexts into account. Lots of people have a lot to say about Tolkien's use of medieval literature, especially whenever a new film comes out, but these opinions aren't always particularly well-informed: take this article, for example, in which the journalist is under the strange impression that 'humour and lightness' and 'comical understatement' are characteristic of Old English verse, and that the comedy bits of The Hobbit are therefore more like Anglo-Saxon literature than The Lord of the Rings is. (Where do you even start with that? And I've read so many articles like that this week...) Actual ignorance is entirely forgivable, but there are rather too many people around who pride themselves on understanding Old English literature because they once read a translation of Beowulf. Having only the haziest ideas of what other poetry exists in Old English - if they know there's any at all - they yet feel qualified to pronounce upon its characteristics, style, and quality. (The last is the most irritating.) To such people I might gently suggest a little humility: it's wise to remember there's much, much more to Old English literature than Beowulf – wonderful as Beowulf is – and whatever you or I may think we know about the immense treasure-hoard of medieval literature, there's always more still to learn. 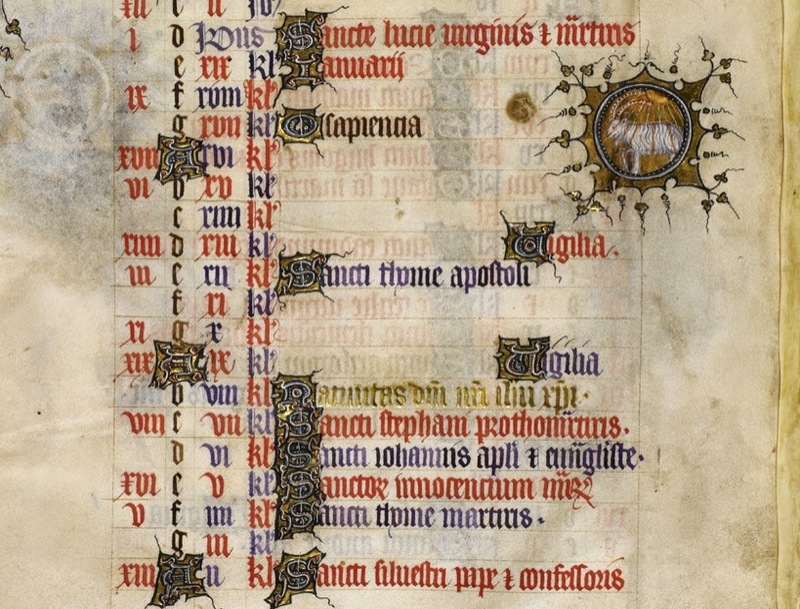 In medieval England, 16th December was the first day of the O Antiphons. (In other parts of the church they began on 17th December, but they lasted eight days, rather than seven, in English tradition.) Every day between now and Christmas Eve, at Vespers, in the early dusk of a midwinter evening, the antiphon would be one of these ancient songs of longing and desire, which address Christ by a series of allusive titles drawn from scriptural tradition and appeal to him: Come. 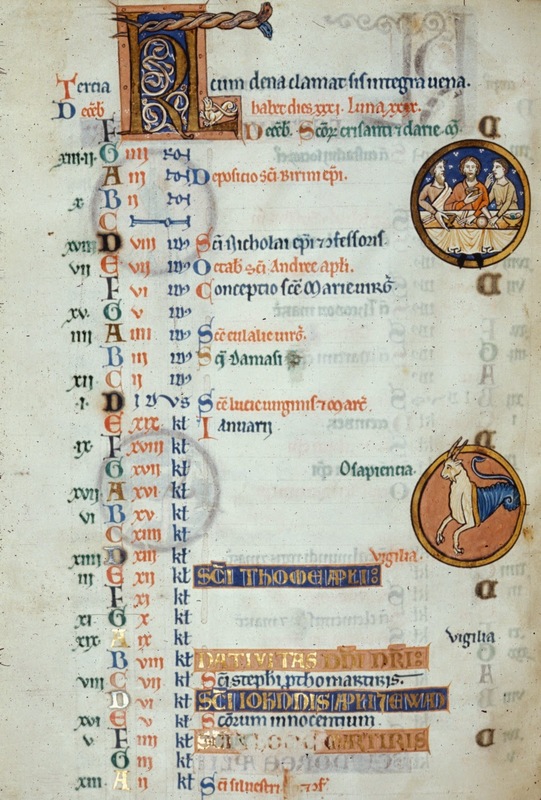 So memorable was the beginning of these antiphons that it was marked on 16th December in calendars like the one above, almost as if it were a saint's day - not an honour often accorded to liturgical antiphons. 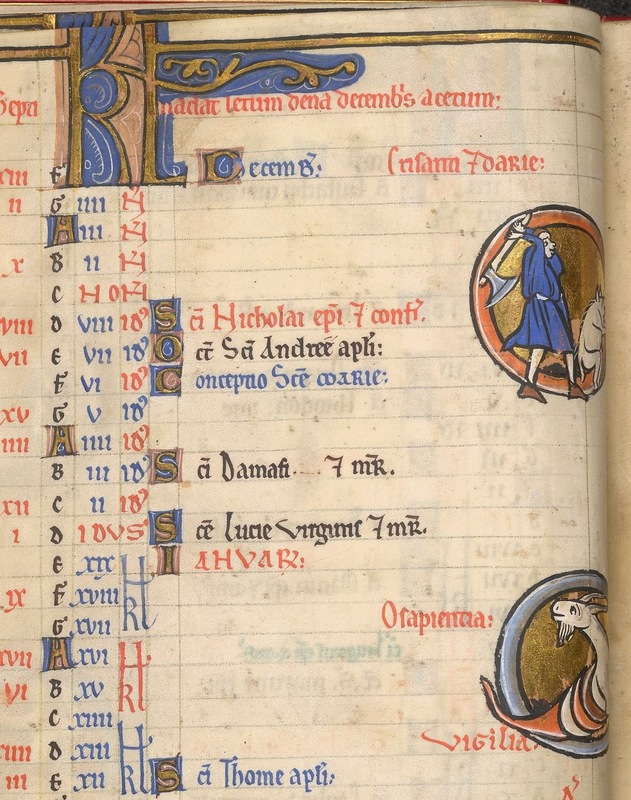 Turn to the calendar for December in the Book of Common Prayer, and you'll find it there too. come to tech vs þe wey of flyth. Come to teach us the way of flight. The antiphon is O Sapientia, quae ex ore Altissimi prodiisti, attingens a fine usque ad finem, fortiter suaviterque disponens omnia: veni ad docendum nos viam prudentiae ('O Wisdom, proceeding from the mouth of the Most High, reaching from one end to the other, mightily and sweetly ordering all things: come and teach us the way of prudence'). Hear it sung here. The English verse survives in a fourteenth-century manuscript of sermons (Worcester, Worcester Cathedral Library F. 126), and is recorded in Siegfried Wenzel, 'Unrecorded Middle-English Verses', Anglia 92 (1974), 55-78 (72). 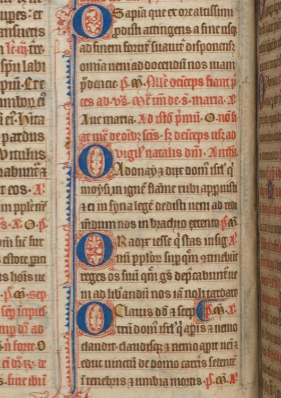 (It's the only one of the O Antiphons to be translated there, but the same manuscript also contains a short English version of the Advent collect which begins 'Stir up, O Lord...', rendered 'Egg our hearts, Lord of might...'!). The worthiest that ever was. The word suggests quiet, steady movement, perhaps - something gentle, like a breath. I can only assume that in the last line 'the way of flight' means something like 'the means of departing from this world', though it doesn't seem like an accurate translation of viam prudentiae. But isn't 'from east to west, from north to south' a beautiful way of rendering a fine usque ad finem, 'from one end to another'? Apart from this little verse, there is a surviving English poetic translation of all eight of the antiphons. It's preserved in BL Harley 45, added in a hand of the late fifteenth century to a slighter earlier manuscript of religious texts. At the time this version of the O Antiphons was added to the manuscript, it seems to have belonged to a woman named Margaret Brent, who was possibly a laywoman from Salisbury. The poem consists of a verse for each antiphon, with the Latin text followed by an English translation and expansion. I won't claim it's great poetry, but several of the verses are lovely; 'O Oriens' and 'O virgo virginem' are my favourites. 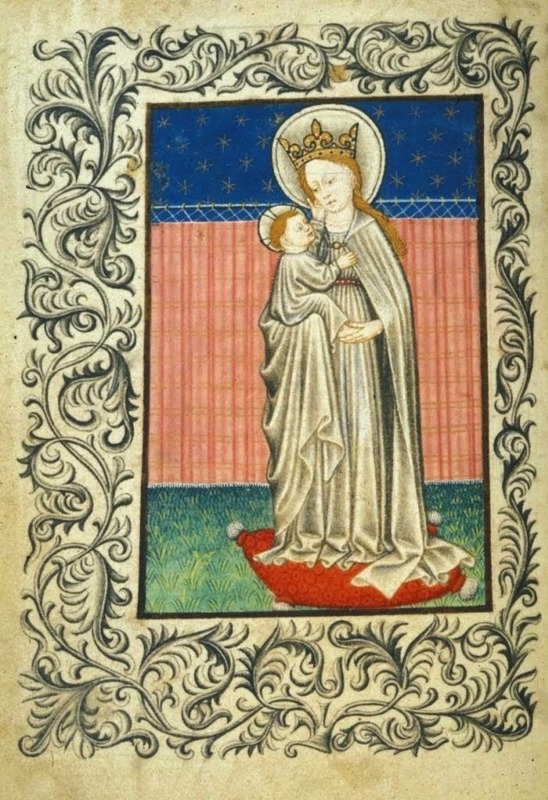 And it's a testament to the power and popularity of these antiphons, the richness of their imagery and the breadth of their appeal; if you were inclined to think of the antiphons as a solely monastic or clerical interest, the example of the devout laywoman Margaret Brent would suggest otherwise. Here's the text as it appears in Carleton Brown, Religious Lyrics of the XVth Century (Oxford, 1952), pp. 90-2, and a modernised version follows. O Sapiencia que ex ore altissimi prodisti Attingens a fine usque ad finem fortiter Suauiter disponensque omnia Veni ad docendum nos viam Prudencie. Come þu and teche vs þe ways of prudence. O Adonay et dux domus Israel qui moysi in igne flamme rubi apparuisti & ei in syna legem dedisti veni ad redimendum nos in brachio extento. Come and redeme in thy powre most extente. O Radix Iesse qui stas in signum populorum super quem continebunt reges os suum quem gentes deprecabuntur veni ad liberandum nos iam noli tardare. Sprakly, blyssyd lorde, be nott ther-in slowe. O clauis david & septrum domus Israel, qui aperis & nemo claudit, claudis & nemo aperit, veni & educ uinctum de domo carceris sedentem in tenebris et in umbra mortis. Off synne shadowed with mortalle derknesse. O oriens splendour, lucis eterne & sol iusticie, veni et illumina sedentes in tenebris & umbra mortis. To lyght vs þat sytt in þe derknesse of dethe. O rex gencium & desideratus earum, lapisque angularis, qui facis vtraque unum, veni [et salva] hominem quem de limo formasti. Made of vile erthe to resemble þi fayre figure. O Emmanuel rex & legifer noster, expectacio gencium & saluator earum, veni ad saluandum nos domine deus noster. And saue vs, thy seruauntis, fro myscheff all. Owr lord, owre good, owre louyng redemptore. O uirgo uirginum, quomodo fiet quia nec primam simile, uisa es nec habere sequentem, filie ierlm quid me admiramini diuinum est misterium hoc quod operata est in me. How þu, a maydyn, art the moder of Ihu. ‘The hye myght of god þis mystery first be-gane. Come thou and teach us the ways of prudence. Come and redeem with thy power's greatest extent. Swiftly, blessed Lord, be not therein slow. Of sin, shadowed with mortal darkness. O oriens splendor, lucis eterne & sol iusticie, veni et illumina sedentes in tenebris & umbra mortis. To light us who sit in the darkness of death. Made of vile earth to resemble thy fair figure. And save us, thy servants, from mischief all. Our Lord, our God, our loving Redeemer. How thou, a maiden, art the mother of Jesu. 'The high might of God this mystery first began. The Son of God ys man becum. From heuen to erthe he cam adowne. Man to redeme and bryng to grase. And browghte to that blysse he bowghte vs to. Richard Greene, The Early English Carols (Oxford, 1977), p.50. This carol, which dates from c.1500, comes from a manuscript (now BL Lansdowne 379) containing just two carols, amid a diverse range of other texts. According to Richard Greene's list, it includes: "English sermons on the Eucharist, for Easter, and for All Saints. A copy of Bishop William Lyndewode's Constitutiones Provinciales... Prescriptions for the stone, toothache, etc. Notes of the temperaments of the body and the four elements. Notes on chronology. English prayers (imperfect) by a member of the Charterhouse, London" (Greene, pp.304-5). Quite a spread of interests, spiritual and secular! 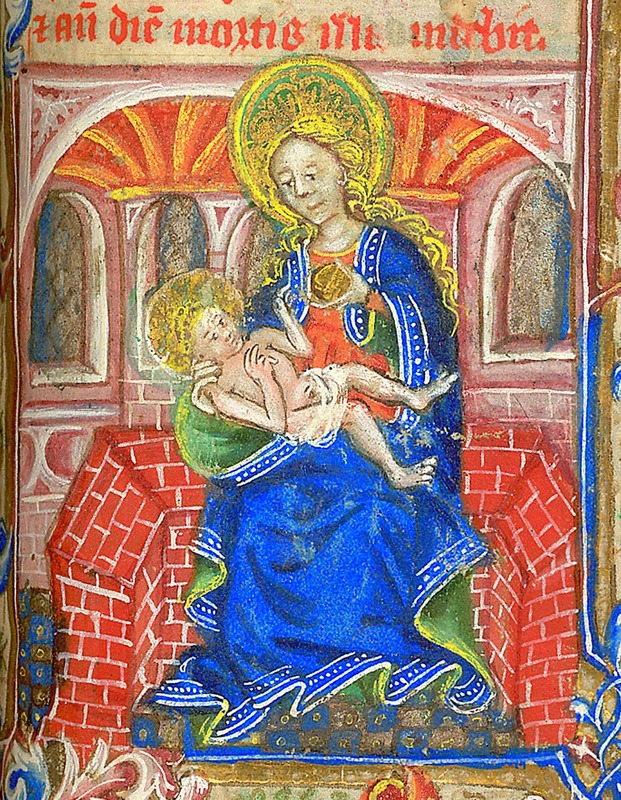 This carol, with its sprinkling of Latin, has rather a learned air, and it's infused with the liturgy of Advent and Christmas: the Latin phrase in the refrain is taken from an antiphon used on the Octave of the Nativity (more properly 'Mirabile mysterium'), and the first verse is based on Psalm 85:11 (or 84:12), veritas de terra orta est et iustitia de caelo prospexit, used as an antiphon at Christmas and as the refrain in another English carol. 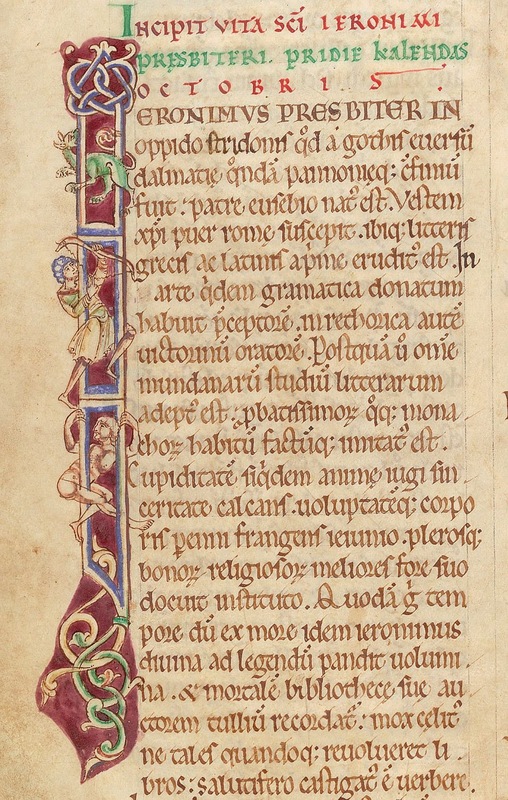 The second and third verses appear to draw on the description of wisdom in Wisdom 8, which is used in the first of the Advent 'O' Antiphons, 'O Sapientia'; 'hym that ys bothe Alpha and O' seems to echo attingens a fine usque ad finem, and tomorrow I'll post a Middle English translation of the antiphon which renders it in just that way. I think the last verse is my favourite: 'celestial citizens' and 'brought to the bliss he bought us to' are both nice turns of phrase. The Son of God is man become. From heaven to earth he came down. Man to redeem and bring to grace. And brought to that bliss he bought us to. In the spirit of 'musing in my mind', I've been thinking about the positive response to my recent post on a medieval Advent carol, which both here and on Twitter was rather more enthusiastic than I was expecting. (I like the carol very much, but I don't always expect my readers to love what I love!) I wonder if it was in part the reaction of surprise. It seems to me that the medieval carols best known today are those which deal with the Nativity, or perhaps with the Virgin, and I wonder if this perpetuates a slightly inaccurate impression of what medieval carols are like: people often talk knowingly, though wrongly, about medieval carols as simple and charmingly 'naive', sweet little ditties about a baby in a manger and his gentle mother singing lullabies. 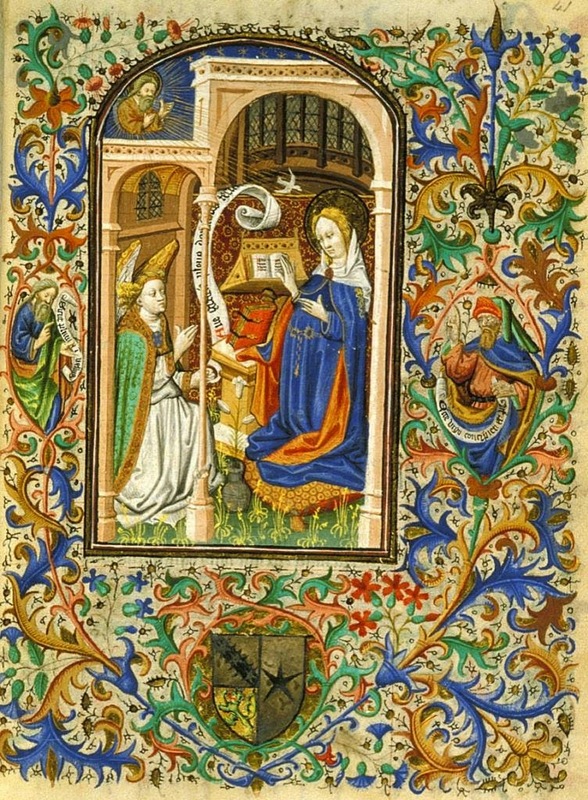 But in fact there's almost no limit to the complexity of the ideas and images which medieval carols could encompass, informed by scripture, the liturgy and the writings of the Church Fathers; many of them are theologically learned, intelligent poems, no less sophisticated for being composed in short rhyming English verses. 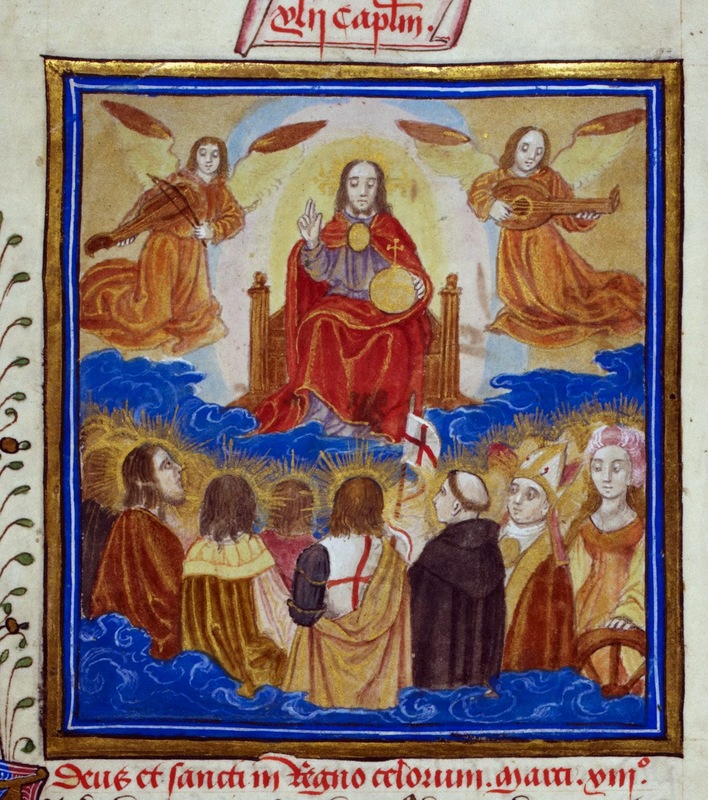 This carol, though not especially brilliant or original, belongs in that tradition, along with 'Behold and see', or 'This world wondreth', or the carol translations of 'Conditor alme siderum' and the O Antiphons (and to move away from Christmas, carols about the Trinity and the Eucharist and any number of other intricate concepts). In these texts there's a willingness to address huge, abstract ideas, things which are 'marvellous' and beyond understanding, yet which repay meditation and the exercise of poetic skill. The carols which explore the story of the Nativity, too, often do so in startlingly fresh and imaginative ways; I'm thinking of 'Under a tree', which imagines the pregnant Mary picturing her half-known, half-unknown future with her unborn baby, or 'Marvel not, Joseph', which conjures up a doubting, worried St Joseph, or the darkly beautiful lullabies in which the baby Christ describes his own death. These texts are infinitely thought-provoking, not only about the story of the Incarnation, in which abstract concepts like truth and justice and wisdom become concrete, become flesh, but also about human experience of time, memory, hope, and loss - many 'marvellous things' to muse on. Where is the summer, the unimaginable Zero summer? Oure helpe and our socour. Wherof a floure shall ascende full soote." This yerde, Mary, his boure. To cease oure grete langoure. To save us fro dolour. But encreace day and houre. That mayde full of honoure." Richard Greene, The Early English Carols (Oxford, 1962), 67. Our help and our succour. Whereof a flower shall ascend full sweet." This rod Mary, his bower. To ease our great langour. To save us from dolour. But increase day and hour. That maid full of honour." Perhaps the carol's simple language only enhances its beauty, conveying complex theological ideas without obscuring them; it becomes transparent, you might say. The image in the last verse, of Christ entering the world through Mary like the sunbeam passing through the glass, is a very common simile in medieval literature, and one that I'm fond of (compare this carol, and this poem). 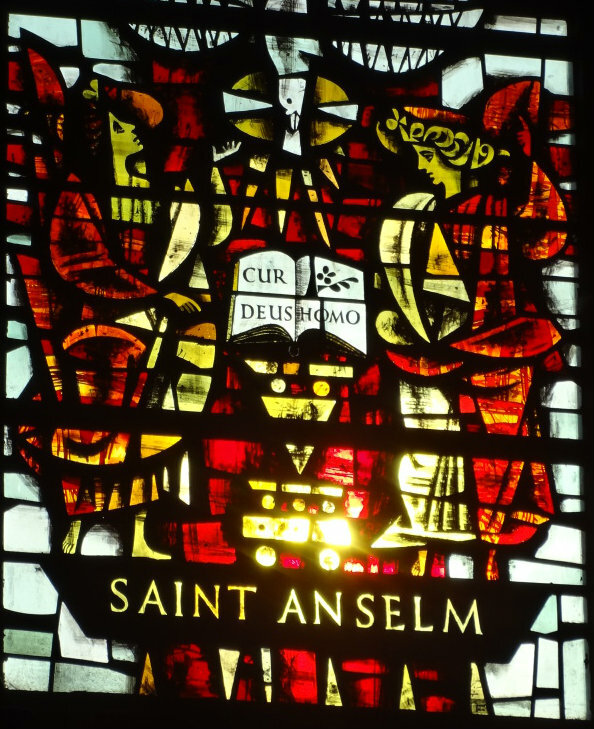 The attribution to St Anselm is not strictly accurate, in that the image doesn't appear in his works, but it was 'a simile much used in the school of Anselm', according to R. W. Southern. For the practice of citing a learned authority in a carol, compare the reference to St Ambrose in 'This world wondreth'.